With my birthday over for another year, it's time to think of Christmas. And what would be Christmas, without guinea pigs? Christmas just isn't complete without a retelling of the Christmas Nativity story, but the story has never been told with guinea pigs before. Mary and Joseph make the journey to Bethlehem, only to find there's no room at the inn. Along come angels, shepherds, and three kings from afar to worship the baby Jesus in the manger. 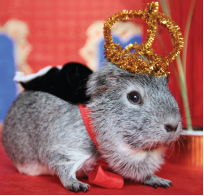 A Guinea Pig Nativity is the classic Christmas story as you've never seen before, starring guinea pig photographed in the starring roles. Sweet, humble and funny, they bring their own brand of guinea pig joyfulness to the nativity in a way that is completely irresistible. Published by Bloomsbury Publishing, RRP AUD$14.99, hardback. Thanks to Bloomsbury Publishing, I have two copies of this delightful book to give away. To win, you must be a follower of my Facebook page. 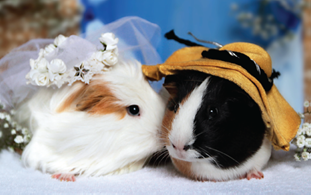 Then, leave a comment below sharing what story you'd like to see the guinea pigs act out next and why. Winners will be drawn on Wednesday December 4, at 5 pm AEST. See? 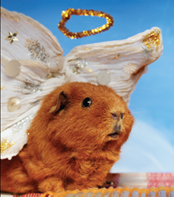 You've never lived unless you've experienced the Christmas Nativity told by guinea pigs! That is so cute I'd love to win this for my friend's daughter - all her baby bunnies died after their minded them during fires. Guinea pigs are very cute indeed. I'd like to see 'The three little pigs' done with guinea pigs rather than the pink, less hairy, but much larger, animal. Would the wolf be a guinea pig? Yes, probably, although he'd have to wear a costume! Guinea pigs freak me out. Dunno why. I screamed like a little girl when I inherited 2 of the bastards from my lazy Emos and had to clean their cage.